Remington has earned a reputable name in the men’s grooming industry with its high-quality grooming set with efficient technology. It manufactures trimmers that provide ultimate comfort and flexibility for users to choose the exact length of hair/beard style that they want. The Remington MB4011 Gentleman’s Grooming Set is no exception to this rule. With the personalised and cool styles that are possible with this grooming kit, men carry off their new stubbles/beards and haircuts with a new-found confidence. This kit is a one-stop solution for all your grooming requirements as it comes with a variety of features and settings that are designed for the true gentleman in you. Take a look at these the features in this grooming kit review. This is a very average set, and if you have a very thick beard or hair in general this isn’t going to do the trick. The most important factors that work in favor of the Remington MB4011 Gentleman’s Grooming Set is its price. 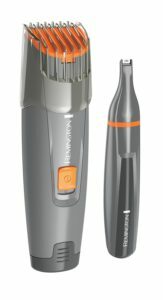 It comes with two trimmers – beard and nose & ear for a price of around £20, which is truly commendable. Both these trimmers have inbuilt adjustments to give you the flexibility of choosing the length that you want. Therefore, this kit offers great value for money. However, is comes in with a subpar 3.7 out of 5 stars, and the overall reviews do not put to favourable a light on this Remington grooming kit. We recommend you read some other reviews first before buying this, unless price is your main deciding factor. If you are looking for a beard trimmer the best place to start is our quick guide Top beard trimmers, and if you are looking for a top grooming kit here is a very good one Philips QG3337 Grooming Kit Review.